My Visual Mihi represents my family and I. In the top left is my mountain (Ruapehu) with my river (Willowbank River) wrapped around it, and there is a clover to show that I do Girl Guides. 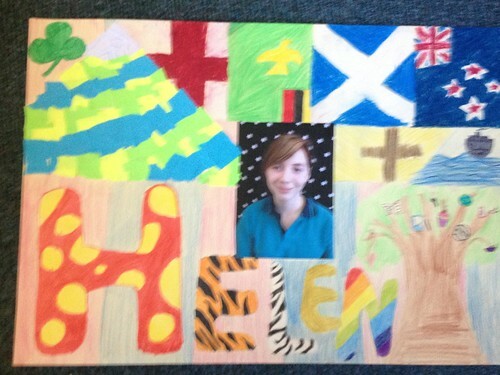 The four flags across the top are the countries I'm from; England, Zambia, Scotland and New Zealand. The cross on the right shows I'm Catholic and the boat is the boat that my dad came on from England to New Zealand. The tree in the bottom right is there because I like nature and it has my hobbies in the branches. I think Mihi's are art, family studies and english because it's drawing and collage, it's about you and your family and pictures are worth a thousand words- they can tell stories.